This sunshade product is made from molded ABS plastic, custom painted to one of the colors listed below. 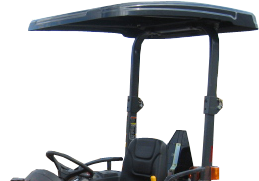 The sunshade comes complete with steel supports and mounting brackets to fit most Ag Tractors, Front Mount Mowers and Other Small Equipment. Equipment must have an existing ROPS or equivalent structure for mounting. This sunshade is NOT FOPS rated. These sunshades measure 47" wide by 54" long. Select your color and optional accessories from the choices listed below. Note: Brackets attach to all ROPS with a minimum rectangular cross section of 2 inches by 2 inches, up to a maximum cross section of 4 inches by 4 inches and a minimum horizontal length at the top of the ROPS bar of 15 inches.